Air will come out of the vents but no heat comes out just cold air? 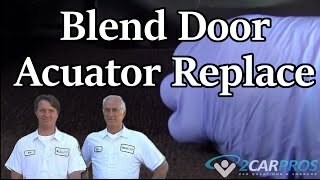 It sounds like you have a temperature blend door actuator that is not working here is a guide to help you see what you are in for when doing the job and the location of the actuator for your car below. 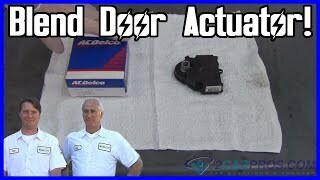 Thank you so much for this post I had this same problem and got an actuator for $76.00 and installed it. Took longer than I thought but all fixed! I love this site. Sounds like the mixing doors are stuck closed. Is there a hissing noise that you can hear? Or clicking noise. No heat. Water pump replaced last year. Hose broke about a month ago and all fluid was replaced. There is talk about acuators on line, but I can't locate them in the car book. Is there a fuse for them? Try pulling the hvac fuse for 60 seconds with key on then reinstall sometimes that resets the actuators. There are two one for left and one for right and one for heat/cool #2 is heat but it may be #1 as well. Pic is under the dash on rh side. The driver side will cool but not blow any heat. Does this side have a fuse or something that controls the heat. I have a 2004 Chevy Impala 62K miles with the same issues and I took my vehicle to the Dealership as I'm not a mechanic and they deteremined it was the temp actuator on the 04 model there are 3 as I was getting warm air on the passenger side;however it just blew cold air on the driver's side. I ended up paying $301.72 just to have this plastic piece replaced. The price on the part alone was $54.88 the labor $213.95. Good luck, I'm now having other issues with my battery light and a few months ago I just replaced the battery, alternator and at 32K miles the waterpump also went out? I'm not happy with this vehicle. Heat coming in on passenger side but not on drivers side. Put in new thermostat and actuator but neither made a difference. Wondering what else it could be? If it is building up pressure real fast I would suspect a bad head gasket but most likely its air in the system. Ii let them run until real hot then let it cool down then recheck coolant level and repeat. My 2005 Chevy Impala car heater only works when I press the gas pedal down. When I'm not driving it blows cold air, what could be wrong? You have air int he cooling system. These motors can be a bit of a bear to bleed out. Open the radiator when safe. Top off with coolant, start car and turn on the heat, let it warm up to operating temp, raise rpm to 2500 and hold it for 5 seconds (you will need to do this several times through out this procedure), If you have bleeders located on t he the bypass hoses (there may be 2. 8mm), crack them open just enough to let any air out and raise the rpm by hand at the throttle body. 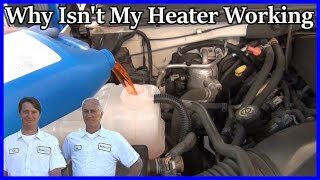 Keep doing this till you have heat at idle and a steady flow out of the bleeders, and then top off the coolant in the radiator. My heater blows cold air? What are some things I can do to troubleshoot this? With the engine at full operating temp, locate the 2 heater hoses where they go into the firewall and feel them to see if they are both too hot to hold. If they are. The heat in that vehicle is controlled by a blend door that regulates heated air flow. It is operated by an electric motor/actuator. The problem can be that the actuator is stripped or inoperative or the door itself could be damaged. This is what needs to be determined by examining the actuator and see if it is responding to heat change commands or not. Check fuses, connections, and relays. Drivers Side Heater Works, Passenger Side Only Blows Cold Air. No Clicking Noises.